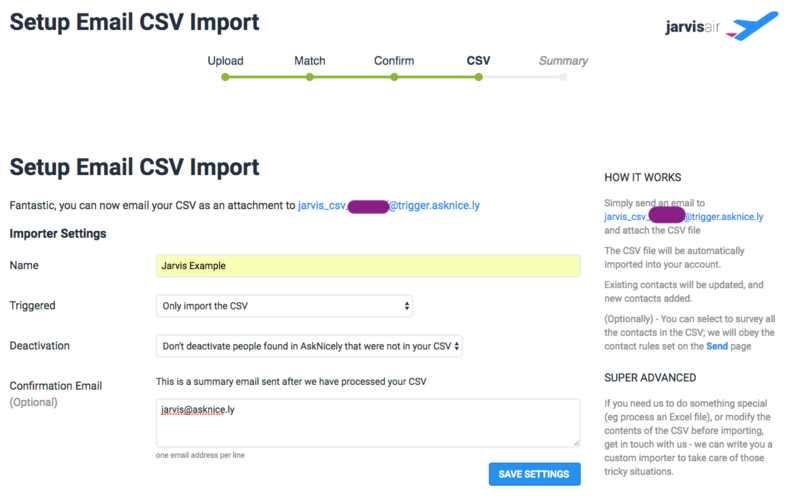 If you're using CSVs to upload your customers then I've got wonderful news for you! 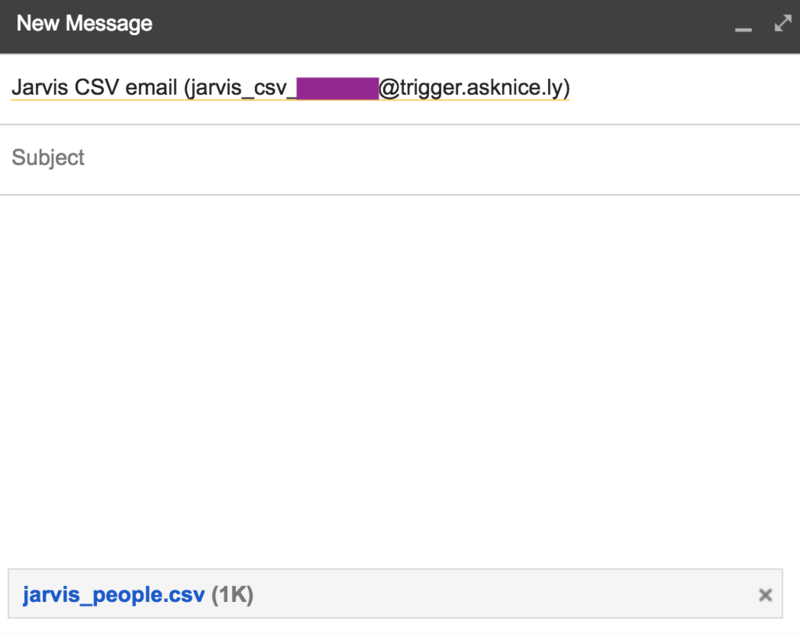 We've quickened the process with our new Email to CSV feature. Quickly email the CSV that you typically upload manually, cutting out several steps of the import process. Build automation with CRM or platform that can auto export a CSV and email it to specific email address. Great for platforms without an API availability or other integration limitations. Over time this will save you hours in automation vs manual uploading. Formatting: The CSV must have the same formatting every time. If you rename columns we won't notice. If you move the email columns then we won't import. If anything in your CSV changes you can always reformat the import by following the first few set up stages. The CSV must be attached. It must be a CSV. Any other Excel format has the potential to fail. Going through the set up process will not upload your current list. You will still need to send an email after setting up the template for the customers to be uploaded. This starts out much like a normal CSV upload, but with a twist. Head over to the People page and select Import People > Import from CSV > then select your file. Then you will match columns from the spreadsheet to how you want them imported, click "Confirm Matches" when done. Only Import the CSV: This will just add anyone on the CSV to the People tab. Allowing your Daily Scheduler to send emails. Import the CSV and add eligible contacts to the queue: This will, upon import, add anyone who's outside of the contact rules and eligible for a survey, to be added immediately to the queue. This is great for sending out an email blast or if you're uploading after midnight (the queue is populated at midnight by the daily scheduler) and want the email to so out today. Import the CSV and survey eligible contacts immediately: This acts as a trigger. Upon upload, if the contact is outside of the contact rules and eligible for a survey, then they will be sent one as soon as the email is received and the document uploaded. No, Don't do anything: This is the Keep everyone option, both the currently active people in AskNicely plus all of these new folks you're adding. Once you've added a name to the configuration, chosen an option from the above, and included at least one email that we can send a recap to, you can click Save Settings > Done. Click the Cog wheel in the top right corner > Integrations > Email to Survey. Scroll down a smidgen and you'll find your Email CSV Importer options. Copy the email we set up and next we'll email our CSV to upload the users we have! This might be a good time to create a contact within your email account with the trigger email address, making it easier to find down the road! All you need is the email address and the CSV attached. No need for a subject or any message within the email. Left picture is if you only imported the CSV. Center is if you chose to add them to the Queue. Right side is if you sent a survey immediately. If you have any additional questions you can reach out to us through the Intercom chat bubble or by emailing hello@asknice.ly. Cheers!